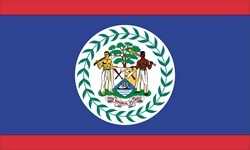 The current design of the national flag of Belize is a continued variant of an earlier ensign that was flown on behalf of British Honduras. This was the actual name of the country of Belize when it was ruled over by the British. The current national flag has been flying from flag poles since 1981, when it was officially adopted as the country's new flag. This flag design features a coat of arms that is very much historical as it dates back to the early years of the 19th century. It was not till the early years of the twentieth century that it was officially recognized as such. This coat of arms has been used on the flag but also functioned as inspiration to the British in the design of some of their ensigns. The supporters of the shield that is used in the coat of arms (a Mestizo and a Creole) also hold an axe and a paddle. The crest is a mahogany tree, as referred to in the motto "I Flourish in the Shade." The shield also shows a representation of a ship, such as was used by the buccaneers of the early 17th century. The flag's background is blue and displays red horizontal stripes at the top and bottom of the banner.